Who's ready for a light and healthy dish? After yesterday's Super Bowl munchies (delicious though they are) if you're like me - you're ready for a light meal just about now. This salad doesn't get any healthier. No oils, no butter - just a nice healthy squeeze of fresh lime juice plus sea salt and fresh cracked pepper. 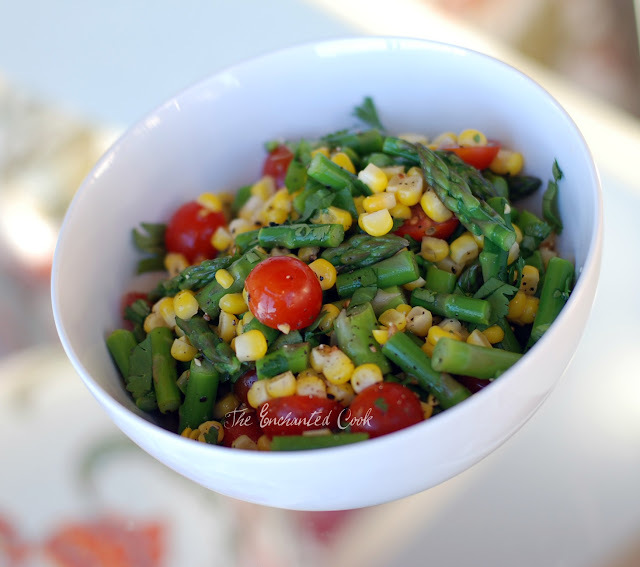 That's all you need to let the fresh asparagus, crunchy corn off the cob, and sweet cherry tomatoes work their magic on your taste buds. 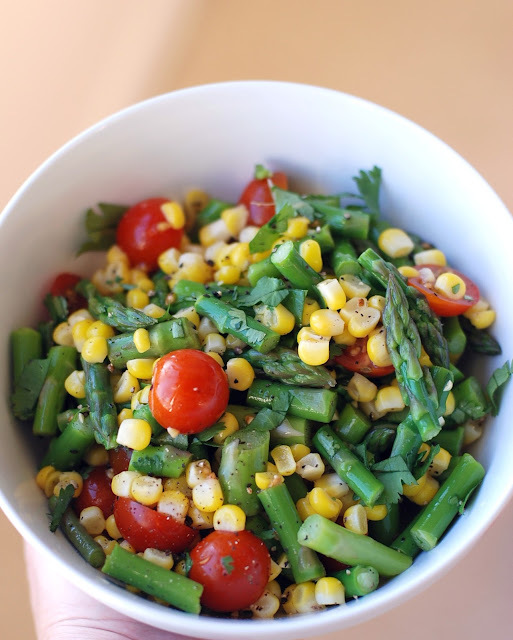 Serve this as a side dish, or enjoy it for a light lunch. Or you can add some protein (like roasted chicken, tofu, or black beans) for a more hearty one dish meal. I like this salad cold or at room temperature. Bring a large saucepan of salted water to boil. While water is coming to a boil, prepare an ice bath by placing water and ice in a large bowl. 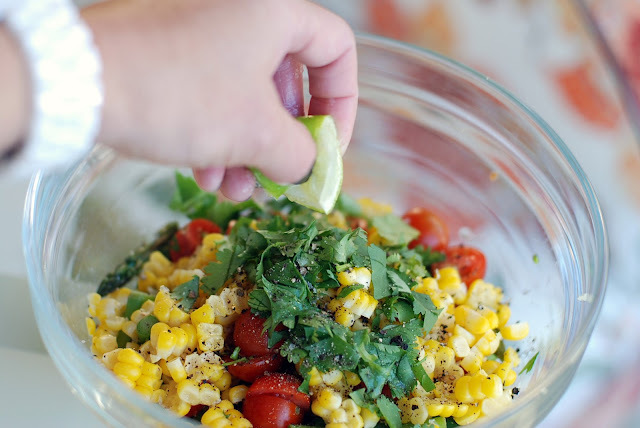 Place the corn on the cob in the boiling water for approximately 1 minute then remove to a plate and set aside. Next place asparagus in boiling water and cook for approximately 2-3 minutes until crisp tender. Immediately remove from the stove and drain in colander. Submerse colander with asparagus in ice bath so that asparagus is covered. Wait a minute, then remove and let drain. Cut the corn from the cob, by placing the flat end of the cob on a large plate or bowl, steady the top with your hand or a corn holder, then using your knife, carefully cut down the length of the cob on all sides to remove the corn. 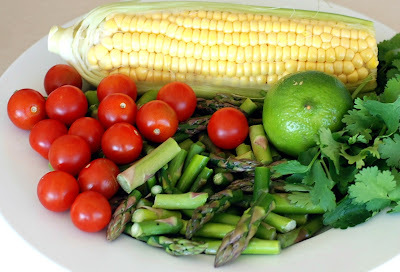 In a large bowl, mix the asparagus, corn, tomatoes, cilantro, juice of 1 lime (more or less to taste), and season with sea salt and pepper. I like to use lots of fresh lime juice which gives a nice acidic brightness to this dish. You're ready to serve as is or you can refrigerate to make colder.